Adela Fonts (Barcelona, Spain) on 9 June 2016 in Art & Design and Portfolio. @STEED: In the Catalan modernism there is always the presence d'mythological animals. In this case it is accompanied by an umbrella decoration. The building was dedicated to selling umbrellas. There is a link below the title that gives information if you want to consult ... Thank you very much. Hugs to you! What a wonderfully wild find !! Un duo surprenant ! Y a-t-il une explication? Fantástica escena, con la magia de lo creativo y original, como tapa de libro que libera la imaginación antes de llegar a sus páginas... Excelente composición, con lindos tonos y luz... Un fuerte abrazo. Un cadrage vraiment original ! j'aime beaucoup, le traitement aussi ! 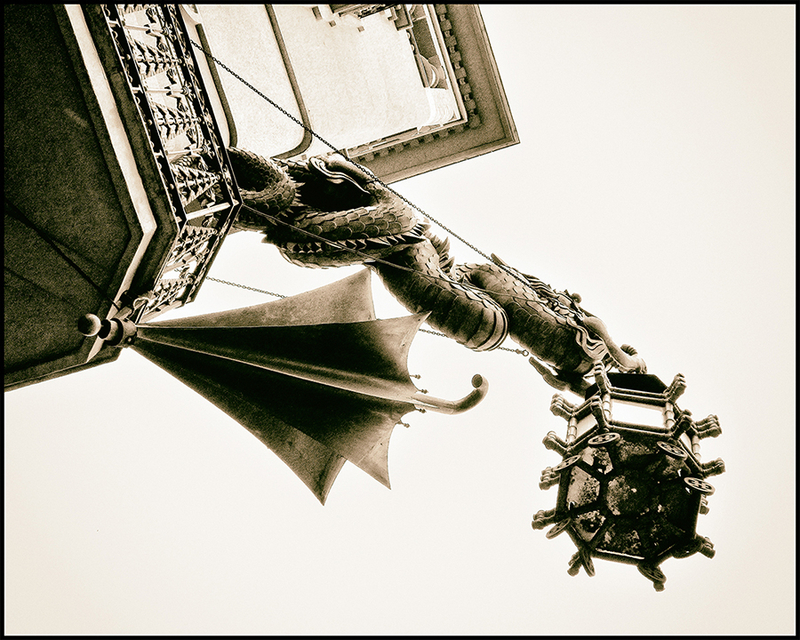 Surréaliste à souhait ce dragon avec ses pneus de secours et son parapluie d'appoint! @Benkirane Thami: Grands mots pour le dragon et moi! Belle soirée chal-heureuse! such beautiful angle, frame, details & treatment! Ouiiiiiiiiiii ! Mais quelle bonne idée ! @Robert D. Burr: ... looking for the diagonal with the dragon's body ...! Thanks a lot Dennis! PÑreciosa sobreexposició i angle!! Una mirada molt personal, com sempre, artística! An interesting PoV that reveals a lot of details! !